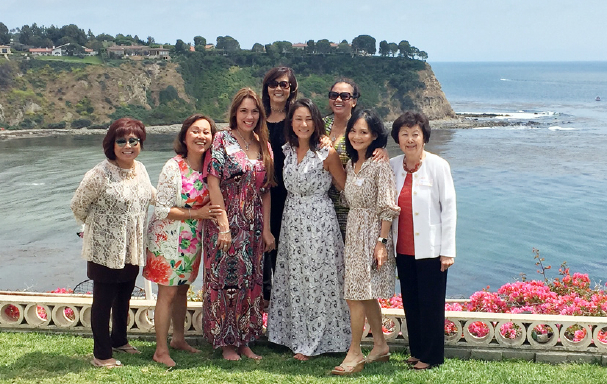 A “Tea by the Sea” was held on May 11 at an Asia America Symphony Guild member’s home in Palos Verdes Estates with a breathtaking view on a perfect spring day. Finger sandwiches, an array of desserts and a variety of hot teas were served. Entertainment was provided by Youth Symphony members: Marcus Chang on violin followed by Kai Nakkim on clarinet. Chairpersons: Karen Bronson and Margaret Shimada. Committee members: (front row, from left) Elizabeth Morinaka, Susan Stern, Lisa Nakkim, Karen Bronson, Leslie Low, Kay Inose; (back row, from left) Margaret Shimada, Lissa Malone. Not pictured: Cookie Atsumi, Val Noguchi, Chris Naito.